Android-x86 8.1 DVD (32-Bit) | Linux DVD Shop - UK Linux Shop supplying Linux on CD, DVD and USB with Free UK Delivery, 24Hr Dispatch. Android, the world's most popular mobile operating system is now available for the desktop PC. Android x86 brings the ease and simplicity of Android to desktop users with superb hardware support and access to over 1 million apps in the Google Play store. With the option of running Android live from the DVD and memory to try and test out on your computer risk-free or the option to fully install the Android OS on your hard drive also. The easy installer can install on a single boot or a multi-boot machine with a few simple steps. With great hardware support for older PCs and netbooks and a range of peripherals automatically detected with full HD support. 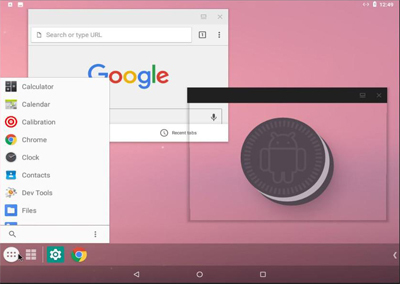 Based on Android Oreo it looks and behaves like regular Android OS with the same speed and multi-task environment you expect from this great OS. Whether reviving an old piece of hardware or looking for a simple yet powerful netbook or laptop experience, Android x86 provides an interesting and useful Linux experience for the desktop environment.